My hearty Green Split Pea Soup with a leftover ham bone will have you coming back for seconds...and thirds! Be sure to check out my recipe video below to see what I mean. I was never a fan of Split Pea Soup as a kid because it was usually served from a Campbell's soup can. It's much better when you can control the seasoning and fresh veggie additions yourself. And it doesn't hurt to have tender chunks of ham mixed into the soup. I always get a large cooked half-ham during Easter week, because that's when it's cheapest. Cooked ham freezes well, so the first thing I do is slice it into single servings and reserve the ham bone. Meat closest to the bone is difficult to remove, so just leave it on. 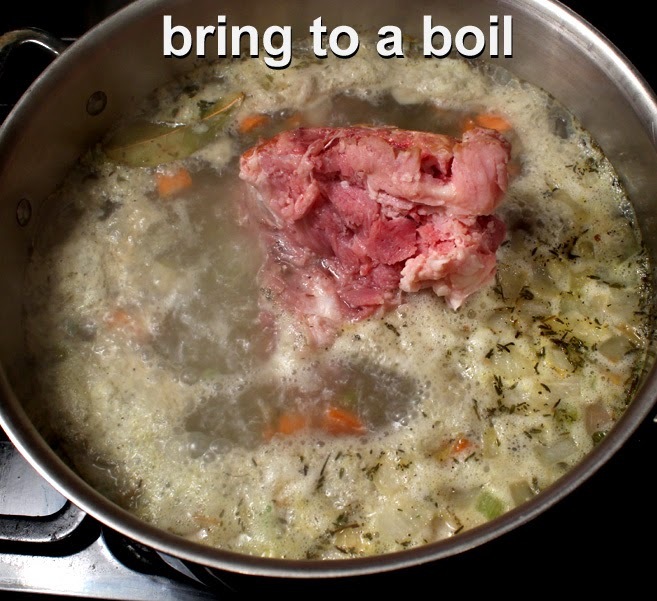 Once the ham bone is simmering in the pea soup for an hour it will easily peel off. All the other ingredients are cheap too, like onion, celery, carrot and garlic. Of course, you can keep this pea soup vegetarian by leaving out the ham. 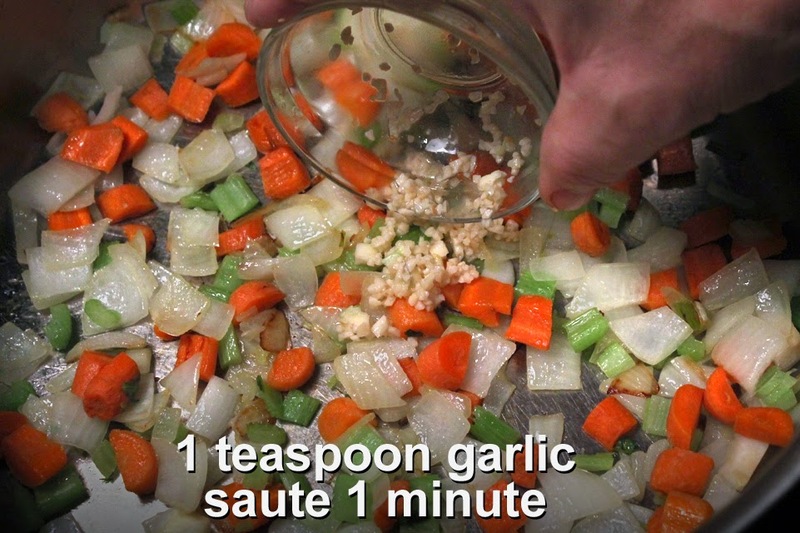 Just substitute some water with a cup or two of your favorite veggie stock, for extra flavor. 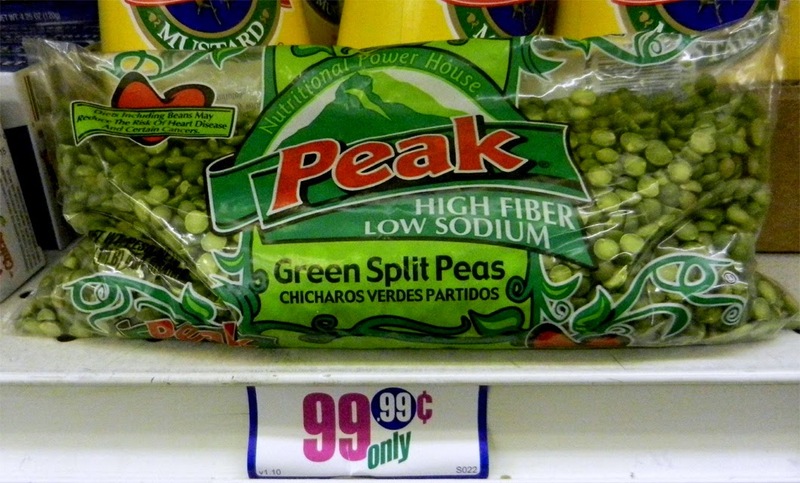 I use cheap dried green peas from my local 99c only Store for this recipe. I've also seen yellow peas that you can cook the same way. What I like about dried green peas is how quick they cook. It only takes about an hour to become a thick creamy soup. Other dried legumes like pinto, navy or black beans take 3 to 4 hours of slow simmering. Green Pea Soup with Ham is almost instant gratification. My Green Pea Soup with Ham is easy to do, it just takes a little veggie chopping. It's the kind of one pot meal that's even better the next day, and you can freeze a few servings, too. So give my latest cheapskate recipe a try, just check out my simply delicious video below, and leave a comment if you like it! Play it here, video runs 3 minutes, 36 seconds. 1 pound dried green split peas - about 2 cups. Rinse and check for discolored ones or any small foreign object. 1 onion - chopped, about 2 cups. 1 stalk celery - chopped, about 1/2 cup. I cut off a bit of discolored tough root end. I also remove some of the strings on the topside of celery stalk. You can remove strings with a knife or a potato peeler - don't worry about removing them all. 1 carrot - chopped, about 1 cup. 1 teaspoon garlic - chopped. Fresh, dried or from a jar. Black pepper to taste - ham has enough salt for me. Add salt if you are going vegetarian. 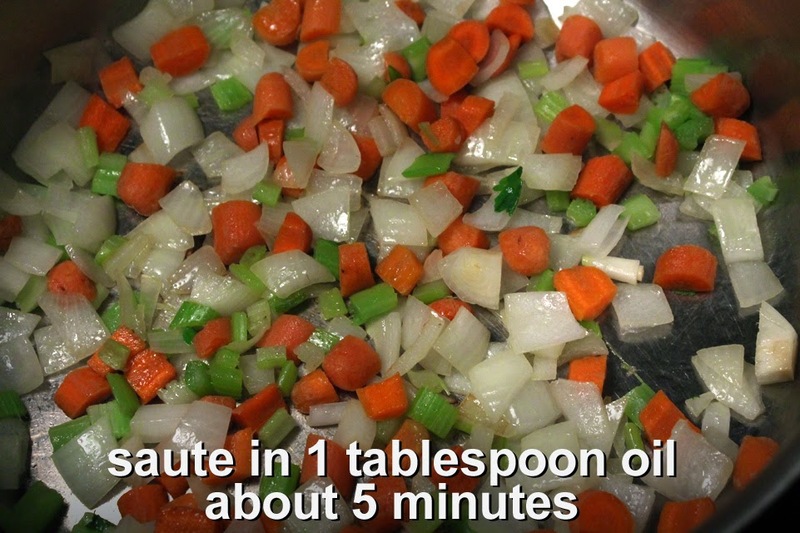 1 tablespoon cooking oil - to saute veggies. 8 cups of water - for cooking pea soup. For vegetarian, substitute some water with veggie broth. Peel whole carrot and chop, about 1 cup. Okay to use shredded carrot or baby carrots. Use a whole stalk of celery, chopped. I include the green leaves, if attached. Remove the tip of the white or yellowed end attached to the root. Add a tablespoon of oil to a large soup pot. Add carrot, onion and celery. Saute over medium heat about 5 minutes to soften. Next add chopped garlic and saute another minute. Now add dried herbs to sauteed veggies. Sprinkle in a teaspoon of thyme and one whole bay leaf. Season with black pepper to taste. I leave out salt, since ham, ham hock, or bacon are salty enough for me. You can add a little more salt if you need to, or if you are making this soup vegetarian. Now time to bring it all together. 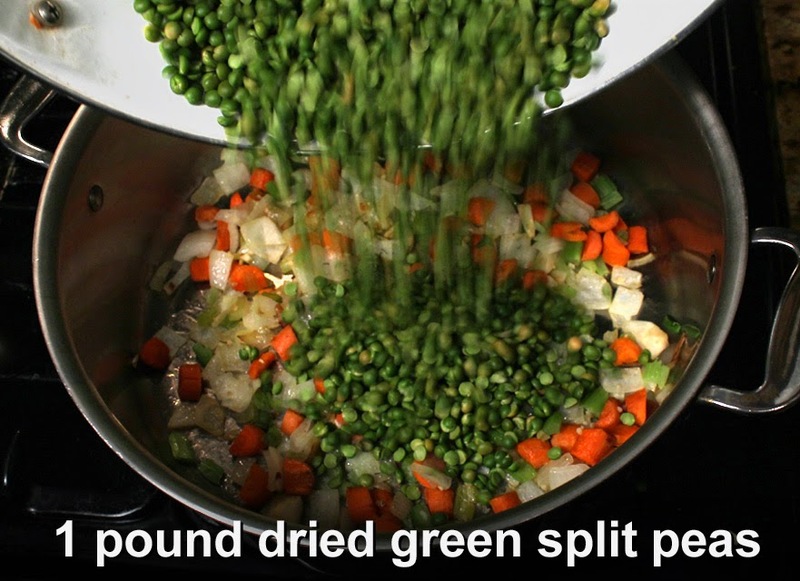 While veggies are sauteing go through dried green peas to remove any debris. I hardly ever find any. Add dried green peas. Pour in 8 cups of water. If you are keeping it vegetarian, then replace some of the water with vegetable stock, for extra flavor. Mix well, increase the heat and bring soup to a boil. 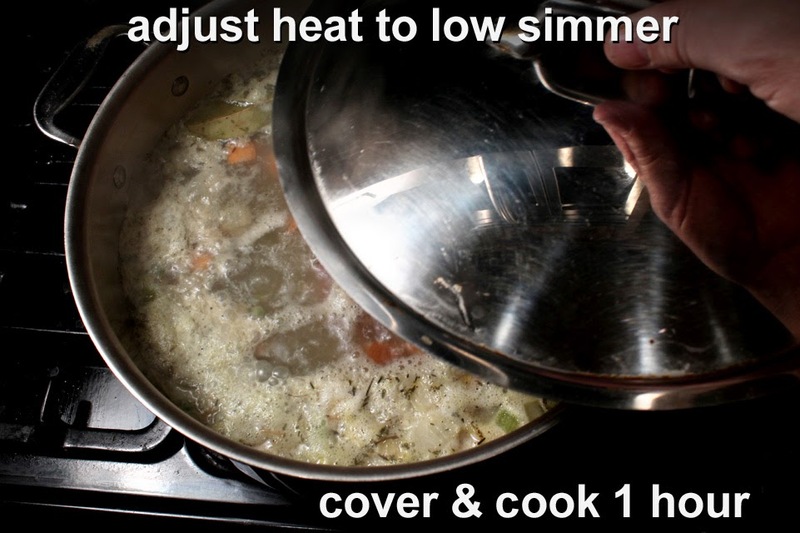 When boiling, reduce heat to a low simmer and cover the soup pot. Cook covered for an hour, until the peas are fall-apart tender. Green peas will turn to a thick sauce, and that's okay. 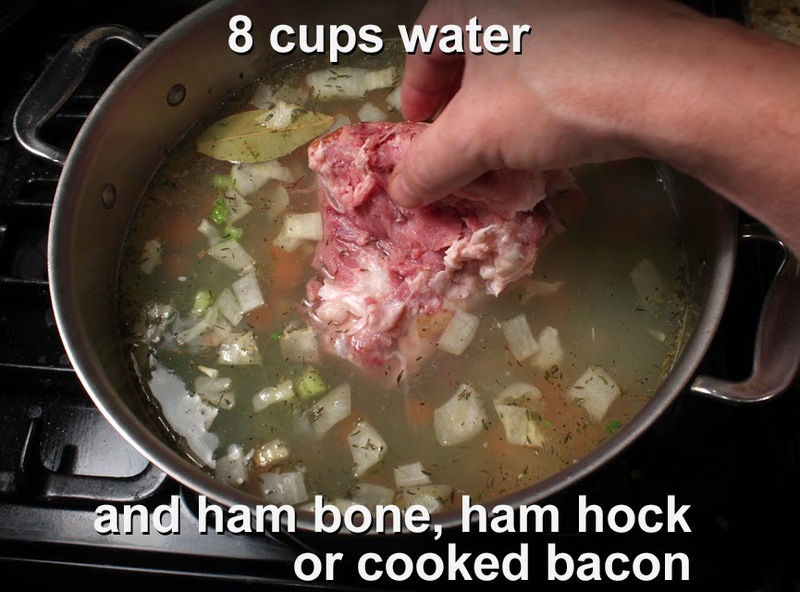 Remove ham bone or ham hock. Allow to cool for a few minutes, while peas cook uncovered. Finally, remove meat and add back into the soup. Stir a final time, and reheat the ham pieces for a few more minutes.